All said, SpaceX is having a really good year. Over the past several months the company has been to orbit four times (a fifth visit was scheduled for this week, but it was postponed). During those visits, it has successfully placed various commercial satellites in orbit and resupplied the International Space Station at NASA’s behest. 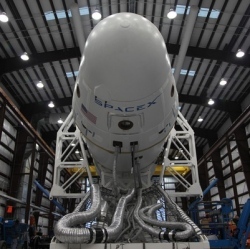 The company inked new deals with British satellite giant Inmarsat, unveiled its new crew-capable Dragon V2 space vehicle, successfully tested 3-D printed rocket parts during a live launch, which has the potential to reduce costs, made inroads into the lucrative national defense satellite launch market, and began testing, with some degree of success, a reusable first rocket stage that could drive down the company’s launch costs by an order of magnitude and further solidify its role as the least expensive launch provider in the market. On Tuesday, Fortune published an article intended to cut through the hype surrounding SpaceX, in particular rumors of an astronomical $10 billion valuation, by looking at its commercial space launch competitors and the crisis posture some have assumed as they attempt to deal with SpaceX. Next to those competitors, which include France’s Arianespace (partially owned by Airbus), International Launch Services (a Russian-American joint venture using Russian launch technology), and United Launch Alliance (a Boeing-Lockheed Martin joint venture), SpaceX and its nimble, startup-like culture seem to have the upper hand.